Even before I became a mom, I was always interested in living a more natural lifestyle. From buying organic foods to reducing toxins in my beauty products, I try to be aware of the products entering my home. However, there was one area that fell short in my “green” lifestyle: our cleaning products. No matter how many times my husband tried to get me to ditch the bleach and fragranced cleaners, I just couldn’t imagine that homemade cleaners and natural products would leave my home sparkling and germ-free. When I was pregnant with my first child, someone shared with me an article on just how toxic bleach can be, especially for pregnant women. From then on, I was pushed into a journey of finding the best and most effective ways to keep my house clean AND green. It’s been a long road, but I’m excited to share with you some of the wisdom I’ve gained along the way. 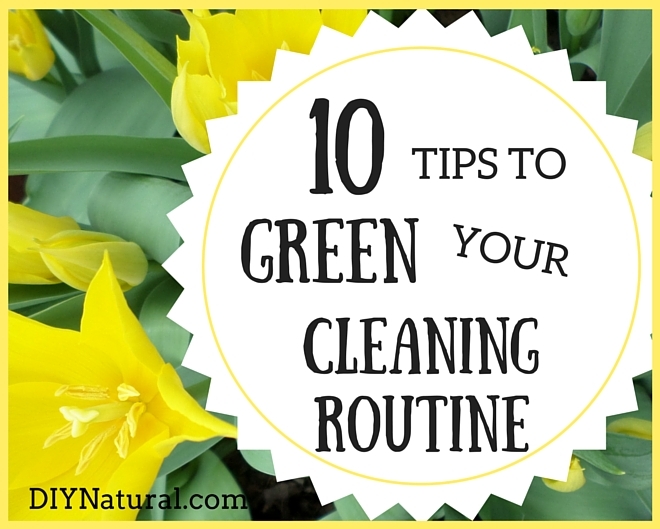 These 10 tips are sure to help you green your clean in 2016. Most commercial cleaners are made with harsh chemicals and synthetic fragrances. These cleaners contain VOCs which find their way into the soft surfaces of your home and can stay there for years! Learn more about VOCs here. 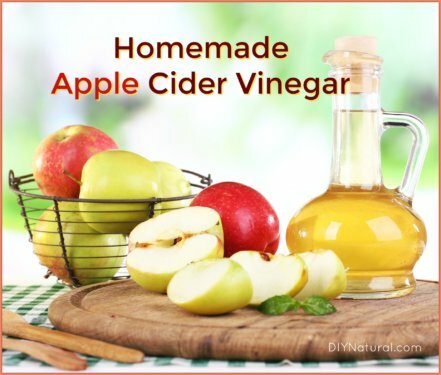 Vinegar has so many household cleaning uses. It helps give a streak-free shine to windows and glass, softens laundry, and even helps repel ants! Making your own cleaner is easy and will save you so much money! Not to mention it eliminates waste from plastic bottles. Check out this list of awesome DIY cleaners. You can also purchase the DIY Natural Household Cleaners Book with 60+ tried and true natural cleaning recipes. Sometimes I’ll get an idea in my head that sounds a little crazy, but I give it a try anyway. Sometimes it works, sometimes it doesn’t. After having family over for a party last year I decided to use the leftover soda to clean my toilet. (I’ve heard people say it can take off car paint, so why not?) To my chagrin, it left my toilet sparking! Here’s proof! My point: don’t be afraid to invent your own DIY cleaning methods. Do your own research and give it a try. Need a little extra elbow grease? Try baking soda. It works really well as a mild abrasive, helping to lift up dirt and grime. Added bonus – it’s an amazing deodorizer. If you are working this hard to green up your cleaning routine, don’t ruin it by using synthetic air fresheners. First, they contain VOCs (see #1). Second, these air fresheners can be dangerous to young children as they are often plugged into outlets or sitting on low tables. 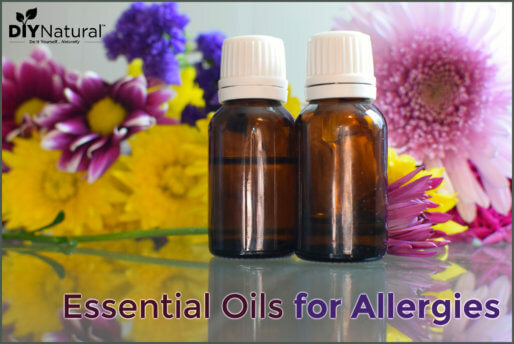 Instead of using air fresheners, try a simmering pot or an essential oil diffuser. Both are super effective (and super green) alternatives. Not only do houseplants brighten up the atmosphere of your home, but many houseplants actually help filter the air of pollutants (including VOCs). There are so many low-maintenance plants available, even for those without green thumbs. This is probably my favorite tip. By opening the windows in your home, you are allowing fresh air to circulate through your home. There are numerous other benefits to keeping the windows open, including helping eliminate VOCs and other stagnant chemicals in the home. Do you have any other tips to add to my list? I’d love to hear yours in the comments below. Hey Katie! Thank you so much for sharing all those useful green cleaners. I am using some of them like vinegar and baking soda. The best and least expensive basement ventilation system on the market is Breeze. It replaces a dehumidifier and costs about $12 per year (continuous use) to run. It expels moist, toxic air (and Radon) from the basement and replaces it with dry, fresh air from the home’s living quarters. Other systems (like Humidex, EZ Breathe, Wave Ventilation) sell for over $1,500 and work on the same principle. The Breeze does the same thing and costs only $299. Check it out at BreezeSystemsInternatioanl.com Ebay, or Amazon. 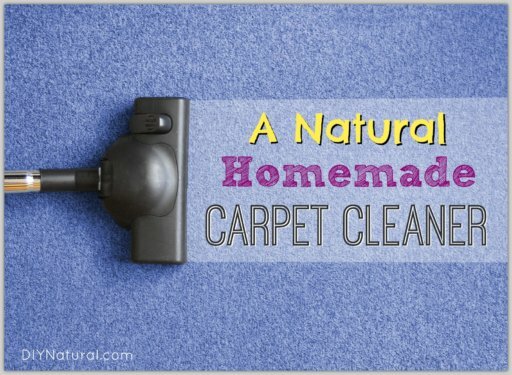 Simple DIY All Purpose Cleaner happens to have been linked to the carpet cleaner. Could you please post the link for the all purpose cleaner? I’ve been looking for ideas for an all natural all purpose cleaner.